Donald Trump won the election, but he's losing the Trump name that adorned three glitzy New York high rises. Three Trump Place rental apartment buildings along the Hudson River are being renamed with just their street addresses -- 140, 160 and 180 Riverside Blvd. The "Trump Place" signs were removed from the buildings on Wednesday. The Trump Organization sold the buildings more than a decade ago. 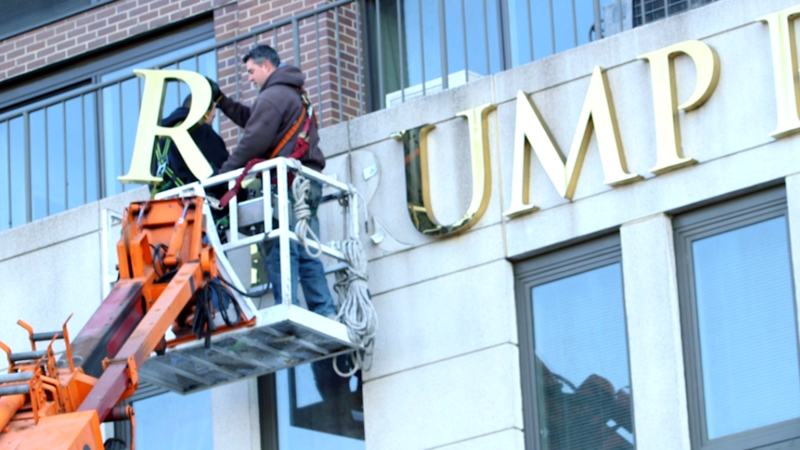 Residents stood outside and watched the giant gold letters come down on Wednesday. "This sign never really meant anything to me from the day I signed my first lease," said 10-year resident Aaron Bollman. "Obviously, the Trump name has a much different meaning to me now. I was really hoping he would lose and he would just go away, but that's not the case." Bollman said he supported the decision to remove the name, that he thought he would make some of the residents feel better about the election results. The buildings were purchased in 2005 by Equity Residential (EQR), a Chicago-based real estate company. "Once Mr. Trump made the decision he was going to enter the political scene, we looked at it and said, 'We just want to be neutral. We don't want to have an opinion,'" Sam Zell, the company's chairman, told CNBC Wednesday. He said that he first talked to Trump a year ago about removing the name, but that Equity had to wait until a deal to use the Trump name expired. He denied that the name was removed in response to a petition by building residents, or that Equity was worried about attracting protesters. "He's going to be the president of the United States," Zell said. "That's a pretty damn good brand." Building resident Linda Gottlieb started a petition to take down the Trump signs, along with her husband and a neighbor, three weeks before the election. "It's a small victory but it feels good," she said. "But how can anything take the sting out of the horror we're in?" She added that "it doesn't get bluer than the Upper West Side of Manhattan." Three other buildings in the complex, which are condominiums rather than rental apartments, will keep the Trump Place name. They are still managed by the Trump Organization.